Utah Legislature • The new conservative senator is focused especially on education. Trent Nelson | The Salt Lake Tribune New state Sen. Aaron Osmond plays a game of Risk on Friday with wife Nancy and son Jackson. 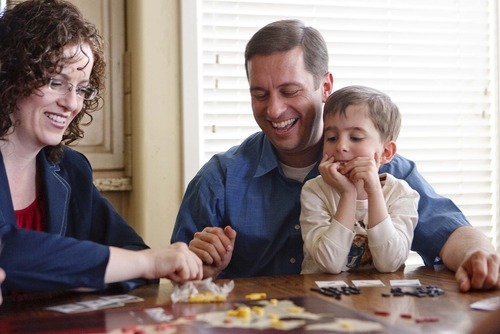 Trent Nelson | The Salt Lake Tribune New state Sen. Aaron Osmond, left, and his son Jackson play a game of Risk on Friday with the family in South Jordan. 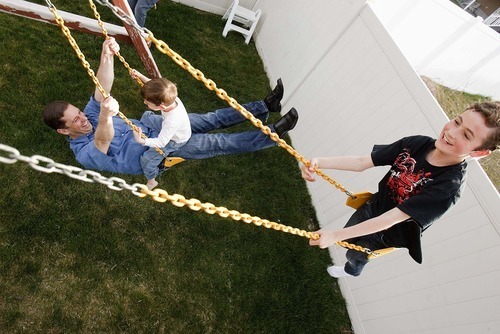 Trent Nelson | The Salt Lake Tribune New state Sen. Aaron Osmond plays with his family on Friday in their backyard in South Jordan. On his lap is son Jackson, and Ryan is at right. 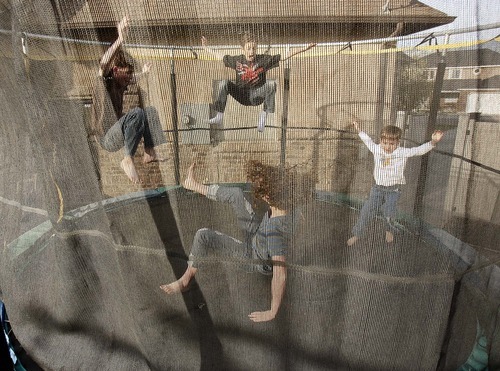 Trent Nelson | The Salt Lake Tribune Four of new state Sen. Aaron Osmond's children jump on a trampoline on Friday at the family's home in South Jordan. From left are Daniel, Ryan, Madalyn and Jackson. 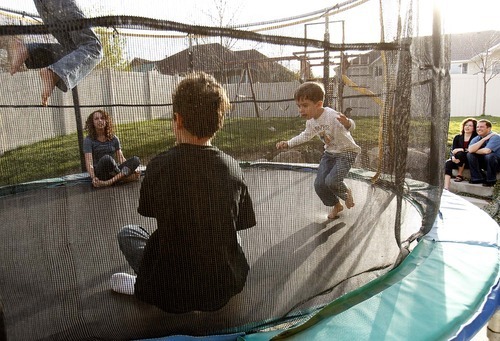 Trent Nelson | The Salt Lake Tribune New state Sen. Aaron Osmond and his wife, Nancy, watch Daniel, Madalyn, Ryan and Jackson jump on a trampoline on Friday in their backyard in South Jordan. 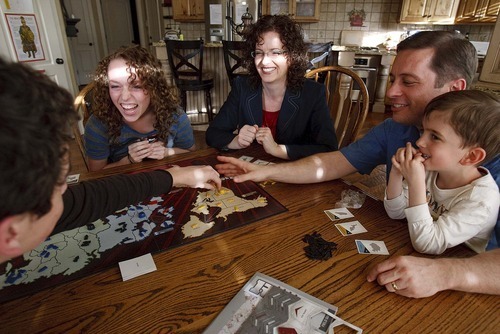 Trent Nelson | The Salt Lake Tribune New state Sen. Aaron Osmond, right, plays a game of Risk on Friday with his family in South Jordan. From left are Daniel, Madalyn, wife Nancy, Jackson and Jameson. Trent Nelson | The Salt Lake Tribune New state Sen. Aaron Osmond, right, plays a game of Risk on Friday with son Jameson, left, daughter Madalyn, wife Nancy and son Jackson. As a member of one of Utah's most famous families, Aaron Osmond grew up used to polarized public opinion, with people either adoring or despising the wholesome clan. It's an educational life experience that is sure to come in handy as Osmond steps in to fill the Utah Senate seat vacated by the love-him-or-hate-him retired Sen. Chris Buttars. Osmond will serve the remainder of Buttars' term and be up for election in 2012. Although the two senators have much in common  both have made education a signature issue and agree on basic conservative principles  Osmond, 41, is already focused on becoming a force of his own at the Legislature. That shouldn't be too hard, say those who know Osmond. "Everyone loved Aaron  and with good reason," said Sen. Mike Lee, who has known Osmond since they were classmates at Timpview High School. Osmond was always popular, Lee said, and seemed to be involved in everything from sports to academic clubs. "It's not surprising to me at all that he's become a leader both in business and in politics." Osmond was propelled into the political scene by his discontent with the Jordan School District split, running for mayor of South Jordan in 2009. Plenty of voters supported his issue, but he quickly realized he was seeking the wrong office. "Education wasn't a city issue," Osmond said. "I needed to be a unifying voice [for the district's communities] so we can drive the issue together." Education has long been a passion of Osmond's, coloring his personal and political life. Family vacations with his wife and five children have been spent with personal guides who spend hours explaining the history of the Roman forums, or reading up on 18th-century history before visiting colonial Williamsburg, Va.
"Education is not just a one-time event," Osmond said. "It's a lifelong experience." The University of Phoenix graduate and former executive at Novell and Microsoft also embraced education when making a career change. He moved back to Utah from Seattle to be closer to family and became CEO of Real Estate Investor Education. The company holds seminars to teach prospective investors about the real estate market, though the company does not handle any client money other than seminar fees. Osmond has been made chairman of the Senate Education Standing Committee, a powerful position that will allow him to share his ideas on education issues. Osmond believes in more control for local schools, with each principal acting as a school CEO with complete control over budget and staffing issues. Public schools are unable to compete with private and charter schools under the current system, Osmond said, and need to be given more freedom from district, state and federal regulation. Immigration is another issue of focus for Osmond, who said he has received hundreds of phone calls from constituents since taking office last month. He favors the repeal of Utah's guest-worker bill, HB116, but feels it needs to be replaced with a new bill that balances business needs for affordable labor with legal residency. "We can find enforcement solutions that respect human rights, enable appropriate reparation for illegal status, support a more efficient legal immigration process, while addressing the need for a low-wage workforce, and ensuring that all immigrants and their families appropriately carry their full share of the tax burden," said an Osmond campaign flier. Osmond was the overwhelming favorite of Republican delegates in Senate District 10, receiving 69 percent of the special election vote March 31. The results were surprising, said delegate Leona Winger, because there were 12 qualified candidates. Osmond beat out several elected officeholders, such as state Reps. Ken Ivory and Merlynn Newbold, as well as several candidates holding Salt Lake County GOP posts. Even with the stiff competition, Osmond maintained a hefty lead through two rounds of voting. "They spoke practically with one voice," Winger said. Voters were likely impressed by Osmond's conservative credentials, said Rep. Carl Wimmer, R-Herriman, noting that they agree on principles such as limited government, lower taxes and individual liberty. "I've really asked him the tough questions, and he has passed with flying colors," Wimmer said, adding that he has extended an invitation to Osmond to join the conservative Patrick Henry Caucus. Although Buttars is "not replaceable," according to Wimmer, legislators are excited to work with Osmond. The dynamics in West Jordan, South Jordan and Herriman are likely to change a bit with the new senator, said Julie Dole, Salt Lake County GOP chairwoman and a resident of the district. Buttars operated more independently, knowing voters understood his principles and expected him to vote with his gut. Osmond is a bit more nuanced, she said. "I don't think that's a bad thing," Dole said. "Aaron plans to get some constituent voices and weigh that into his decision-making." Osmond has already planned quarterly meetings with constituents, and he said that though he will not deviate from his principles, he is willing to listen to opposing views and weigh them before making a decision. Buttars was known for speaking his mind, often creating a media stir. Osmond said he also hopes to make headlines, but through a partnership to reach constituents and inform them of his stance on issues.